Yes all pools need a permit. Your local council will advise you on what is required to obtain a permit for your pool. Do I need to fence my pool? Yes by law your pool requires fencing. Your local council can supply you details of the requirements for pool fencing. Here are some things to consider when decided on your pool size. Who are the pool's main users and how often will they likely be using the pool? How much patio would I like to have around the pool and what are the objects (barbeque, furniture, etc.) that I'd like to fit on the patio? How often do we plan on entertaining and what is the likely number of people at our gatherings? Will our family change size in the coming years?What shape pool? Your garden space and layout will determine which shape will best suit your garden. What is the difference between a "Braced" pool & a "Braceless" pool & which one is best for me? A "Braceless" pool is designed for an above ground installation where you do not wish to fence around your pool. However you would require fencing around your ladder or use a removable ladder. A "Braced" pool can be installed aboveground with decking & fencing around your pool. Both can also be installed part in-ground or fully in-ground. NOTE: Good drainage is required for an in-ground pool. How do I take care of my pool liner? Take care when using floating chlorine dispensers, as they can float in the same area for long periods of time, they can bleach the liner. Do not put sharp objects into your pool as they can pierce the liner. Do not let pets into your pool. Do not add un-dissolved chlorine into your pool, it can cause the liner to become brittle & bleach the liner. Keep your pool clean at all times. Our Liners come with a 5 year manufacturers warranty. What type of sanitation should I choose? The disagreement over salt versus chlorine pools has been going on for quite some time, and there are advantages and disadvantages to both systems. Cost, maintenance and health concerns are the main reasons for debate between these two systems. However, there is no clear-cut winner. Based on your needs and wants, only you can make the decision that you feel is appropriate for your situation. Saltwater pools use dissolved salt instead of chlorine tablets to cleanse and sanitize the pool water. The salt chlorinator unit uses electrolysis to break down the salt and adds the salt to the water. The pool owner has to maintain the pH levels of the water on a regular basis. A consistent salt-to-water ratio level must be maintained. The amount of salt you add weekly or monthly to your pool water would depend on the amount of rain, the amount of backwashing you do to the pool, as well as the amount of water lost due to splashing or draining of the water. Once you have added salt to your pool, you will only be adding additional salt over time to maintain the levels. Keep in mind that salt never "disappears" from water once it is there. That is why the initial up-front cost of the salt is more than chlorine, but over time the cost goes down significantly. More rain will dilute the amount of salt in the pool. Also, the more you backwash the pool and the more water loss you have, the more water you will need to add to the pool. Which again, would dilute the amount of salt in the water. Chlorine pools are the most common types of pools built today. The system to filter and chlorinate the pool is easy to operate, and pool owners often feel better about maintaining their chlorine pool because the chlorine tablets are readily available. Chlorine tablets are sold at many pool stores and other major retailers. Users add chlorine tablets to either a pump unit separate from the pool water or in a floating disbursement device that dilutes the chlorine tablets over time in the water. Owners test the pool water regularly with a kit and add chlorine tablets based on the pH levels needed to balance out the water. The chlorine added kills mildew, mold buildup and bacteria living in the water, making it safe to swim. Chlorine pools require a bit more maintenance, and may end up costing more overall because of the amount of chlorine you may need to add to balance the pH levels in the water. The more rain water, backwashing or water loss that occurs to the pool water, the more variation in the pH levels there will be. The chlorine in the water will help keep the water clearer and cleaner and prevent a buildup of naturally occurring bacteria. What filtration system should I choose? Sand filters are generally the most popular filtration used. The way a sand filter works is, inside the sand filter it uses specially designed rough shaped pool sand which removes the dirt and debris that runs through your filtration system. The cleaned water then flows back into the pool out through the bottom end of the filter. In a sand filter, a back washing effect occurs once the water flows out through the waste line cleaning the filter. Generally, the sand should be replaced every five years, based on usage. Cartridge filters can screen out twice as much dirt and debris as a sand filter. Its larger filtration area allows the water to progress through the cartridge removing smaller particles. Maintenance is much easier in that there is no need for a back-washing step. All you have to do is take the filter cartridge out of the system and wash it off using a hose. These filters can cut energy costs by utilizing low pump pressure. Since the pressure needed is lower it can prolong the life of the pump. Yes all pools require a pool cover. 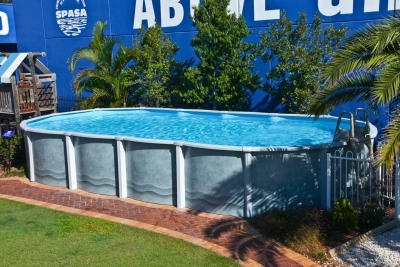 A good quality pool cover helps to prevent heat loss through evaporation. Not only will your pool retain most of its heat by covering at night, covering during the day when the pool is not in use will prevent evaporation & can also help heat the pools surface temperature. Pool cover thickness can also make a difference, the thicker the cover the more efficient it will be.